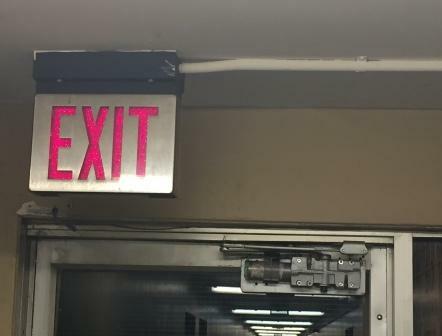 Since smoke rises, we are always told that in the event of a fire, we should stay as low as possible to avoid the smoke, and crawl to safety… so why are “EXIT” signs always so close to the ceiling? Wouldn’t it make more sense to also place “EXIT” signs at knee-level so that they are at eye-level, and visible beneath the smoke as we crawl towards them? Since smoke rises, why are these always located on the ceiling?